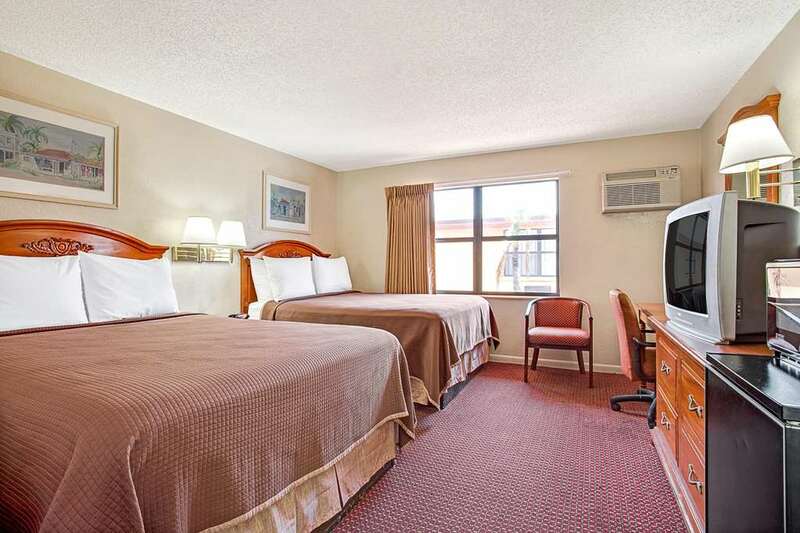 Spend your next fun-filled Florida vacation at this Howard Johnson Hotel - Tampa Airport / Stadium hotel conveniently located off Interstate 275 just five miles from downtown Tampa, historic Ybor City and Tampa Bay cruise terminals. Walk to baseball at Steinbrenner Field and football at Raymond James Stadium. Complimentary airport shuttle service to and from Tampa International Airport is available. Book your next social or business event in the meeting space, and take advantage of the business center. Wake up refreshed to a complimentary Rise and Dine continental breakfast, and plan your exciting day with the complimentary wireless Internet access. After your adventures, relax at the outdoor pool and sundeck, and enjoy guest laundry service. Refresh in your comfortable guest room with microwave and refrigerator. Suites, smoke-free and handicapped-accessible rooms are also available. Pets are welcome at this lodging.